If you are searching for the best Curried Chicken recipe, then you have come to right place. This is the original Jamaican Style Curried Chicken recipe prepared with JCS brand of curry powder for an authentic Jamaican flavor. This delicious dish is one of Jamaica's favorite. 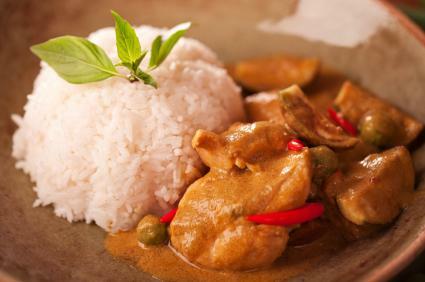 Jamaican curries are a product of the island's rich and diverse cultural background. Not only is it delicious, it's also easy to make, and packs a strong flavorful punch. We've got everything you need to make your own authentic Jamaican curries in our store. Cut chicken breast into 1 1/2 inch cubes. Brown (fry) curry powder, onions, garlic, tomatoes, thyme and pepper in oil. Add chicken and brown (fry) for five minutes. Finally add water, lower heat, cover and simmer for 30 minutes. Best served with white rice. Tastes delicious served with callaloo, rice and peas, or any of a variety of other amazing Jamaican recipes!